Sadly it pains me to say I’d missed Dom and the Ikos two previous visits to the Jumping Hot Club in Newcastle; but more than made up for it by dancing to their rinky-dink tunes for all my worth at the recent SummerTyne Festival! I did worry slightly when I slid the disc into the car stereo; because this type of music is intrinsically made for dancing rather than listening too. But the moment Come In My House blasted from the speakers my world was instantly one of sunshine, gumbo and cold, cold beer rather than a rain filled drive on a motorway. Using the likes of New Orleans musical legends Dr. John and Professor Longhair as a template, the magnificently monikered Dom Pipkin and his Iko’s create a Cockney Gumbo of Jazz, Soul, Funk, Blues and even a smattering of Ska to create a timeless Cockney musical gumbo. Every track, whether instrumental or with Pipkin singing is a whiz-bang joy. The Skinny Man Skank could easily be a lost track by Trojan legends Tommy McCook or Roland Alphonso; who knows, perhaps it is. The tune rolls along from brass section to organ to rhythm section and back again with consumable ease and class just like the 60’s masters of my youth did. Another Ska tune The Firing Line, harks back to those early days and had me dusting off my old 45’s much to Mrs. Magpie’s general annoyance. Dom probably wouldn’t get very far on the Voice or X Factor, but his voice is just perfect for salacious tracks like Your Feet Don’t Know and The Cat Whisperer which had my feet shuffling as I drove along. There is a lovely ballad called The Hen tucked away in the middle that I just adore. To all intents and purposes this is just Pipkin and his piano for a couple of minutes with some gentle accompaniment in the background until the pace picks up slightly towards the end; and I wouldn’t be upset if the next album was in a similar vein. 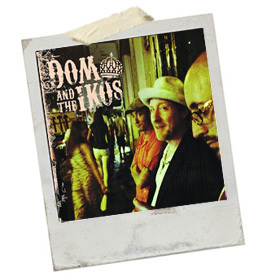 Dom and the Ikos are a bit different from the norm and I salute them for sticking with music that they so obviously love.